Extremely Positive | Live. Learn. Love. Eat. ← I Want To Hear From You! So here is what has been going on with me. I have made some radical changes in my life, my habits and my thinking in the past few weeks and I am feeling like a completely different person. Since I was wallowing in the darkness and negativity of my mind for a good month and finally decided to step out of those thoughts and make a change for myself, I have been feeling just an awesome sense of gratitude for every thing, every one and every day. I have almost seemed to have found that balance and it is absolutely beautiful! I remember the day I decided to change my mind. I had been living in prison to every negative thought and was so down that I actually said to Craig, “There is nothing here for me.” I actually believed just a few short weeks ago that my life was hopeless. I had been down before and I have made it out of of bouts of depression, but this season of depression had seemed so long that I had convinced myself it was impossible and that there was no light at the end of this dark tunnel. I kept looking back on the past and all the times I used to be happy and telling myself that those moments were over for me. I replayed this over in my consciousness for weeks until I worked myself into a very negative state. The evening that I made a change, I finally took responsibility for myself and opened my eyes to the fact that I couldn’t rely on any one to help me out of this, but that it was up to me. I had heard that repeated over and over to me in my mind during those dark weeks, but had always shrugged it off and told myself that this time it would be too hard to get back up. I decided that evening that I needed to change the way that I was thinking. Even the feeling that the negativity had brought to me was like a dark cloud over my mind and a heaviness in my body. I got out a piece of paper and a pencil and began to write out the exact opposite of every negative thought that I had been playing over and over inside of my head. After writing it all out, I could once again hear that voice inside of me that was hopeful and knew that things would get better. That part of myself that I thought would never come back. The part that inspires and encourages. The part that believes and loves. The part that perseveres and knows no negativity but trusts that everything is perfect as it is and that every seemingly hopeless situation is working together for good. It seemed like so long since I let that part of myself emerge and writing those affirmations was almost laughable to me at the time, but deep inside I wanted to believe that they were true. I was sick of all of the negative, defeating, judgmental self-talk and was willing to try anything. I remembered back to last spring when I was practicing affirmations and how happy I was. I looked back to those posts and told myself that I COULD get myself out of this pit. I did it once and I could do it again. That was when I took back my power and started doing what I wanted to do. I have always had this limiting belief inside that says I am unworthy of love and a life that I love. I have carried this message with me for as long as I can remember and have always tried to be perfect. Nothing is ever good enough for me and I somehow always convince myself that I can be happy later, if or when. I constantly chase after happiness as though it will be waiting for me around the corner. The trouble is, it never is. Once I get around the corner I am still unhappy so what do I do? I convince myself it must be around the next corner and continue to chase after a different if or when. Once I made that decision to take my life back and break away from my excuses, (my favorite one being “I can’t”) I started believing that I can. I focused on the positive (what I wanted for my life) and adding in the good stuff, rather than the negative (what I didn’t want for my life). I started eating a salad a day, keeping the house tidy, taking time for myself and exercising until I was uncomfortable and would break a sweat. I wrote out my goals and began reading more inspiring things, rather than spending my time looking back on my past or comparing myself and my life to others. I gave myself no time to hold any more limiting beliefs and started focusing on how I want my life to be. I was reminded of the truth that HAPPINESS IS HERE NOW. Everything that I needed to be happy again was already inside of me. It was only a decision that I had to make for myself. No one else could make me happy because no one else could change my mind and make that decision for me. I decided to write this today because I know that someone out there must be going through this too and if you aren’t at the moment you might find yourself in a dark season or can probably relate in some way to what I am saying. In a society such as ours we are pretty much bombarded with the message that we are flawed, imperfect and therefore unlovable as we are. The world offers us an insurmountable amount of solutions to our happiness. The key to happiness is always thought to be somewhere ‘out there’. The media feeds us the message that we are unworthy and unlovable and then offers us anything and everything to ‘fix’ us, from cars to cosmetics. 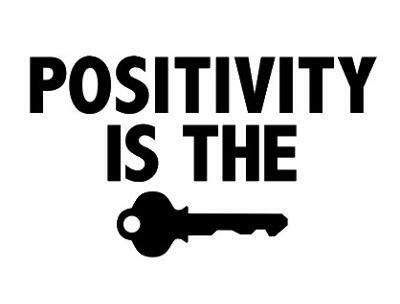 Here is the real key: POSITIVITY. A change in perception. A decision that can only be made by Y-O-U. The beauty in that is that you can CHOOSE to be positive, therefore you can also CHOOSE to be happy. You could wait until tomorrow or look around a few more corners until you find it OR you could decide right now that there is nothing ‘out there’ that can ever make you any more lovable or worthy and begin to live a life that you love. Anyone who knows me really well knows that I tend to always go to extremes. This is part of who I am and how I have always been. I have a determined spirit and when I set my mind on something and make a decision to actually change, I can shock the people around me and even myself. Since I have this tendency and have always thought it was a bad attribute of my personality, I DECIDED today that I am going to use it for good. I am going to be extremely positive. I am going to drive my ego crazy with affirmations until all of my limiting beliefs are extinguished and the only voice I hear is that voice of positivity, inspiration and encouragement. I am grateful for that dark season of my life because it has brought me even closer to the light and allowed me to write this inspiring revelation today.You are what you think. You can choose your thoughts. You have the power within you to make that decision to be happy anytime, anywhere and in any situation. Positivity is the key! Perfect timing! I have been in a slump myself these days and I know that I am the only one that can pull myself out 🙂 It’s nice to know that other people go through these same things … keep up the great work and keep smiling! Thank you so much for sharing so openly about your struggles. I too have been in a very dark place for some time and just reading that their is a light than I can focus on has helped me to think about looking at things differently. Thank you Kathi for your comments! You make me feel like what I have to say is worth posting. thank you for this!i needed the reminder. and oh what truth, what difficult truth to swallow, we create our reality. Thanks so much for this post. I love that you can share what you’re going through. You are not alone and I’m glad that things are getting better for you. I am feeling so negative and down lately-these posts really help. I might print this one out and read it every day! I’m the only one who can make me happy-I just need to be reminded of that continuously!